I had no idea a simple recipe for making your own finger paints for your babies could generate so much attention and blog traffic. I am humbly honored by each and everyone’s comment and visit!! Every time I check my email I have new fans and emails! It’s just so WONDAH-FUL!!!! I’ve been featured in a few places this week that are just THRILLING!! Thank you so much if you are new blog follower, Facebook fan or Twitter follower!!! I have lot’s in store for the Fall and can’t wait to get to know you and share all of our fun ideas and experiences!!! Oh my word! I might be a little late to the party…but I just now discovered CameraSim the online SLR simulator! Another excuse to practice taking pictures!! Here’s a snapshot of what the simulator looks like! You can practice all of your camera settings as much as your heart desires!! Click HERE to go check it out for yourself and play! Who doesn’t like a “stick-to-your-ribs” casserole!!! I love finding new recipes for DELISH casseroles! And I found a FABULOUS new recipe!!! I’m definitely making this on Sunday!! And maybe even a little Sopapilla Cheesecake too! CLICK the images for recipe individual recipe information! Both recipes are from one of my favorite blogs!! I’m a faithful reader of The Green Cattle blog. You must swing by The Green Cattle blog and check out the amazing food! And their funny llama named Tina!! on Thursdays from now on! TOOOOO FUN!!! Click the image above to learn more!!! My weekly embrace the camera picture is from yesterday! My sweet Mamma bought me the caaa-uuutest dang hat! 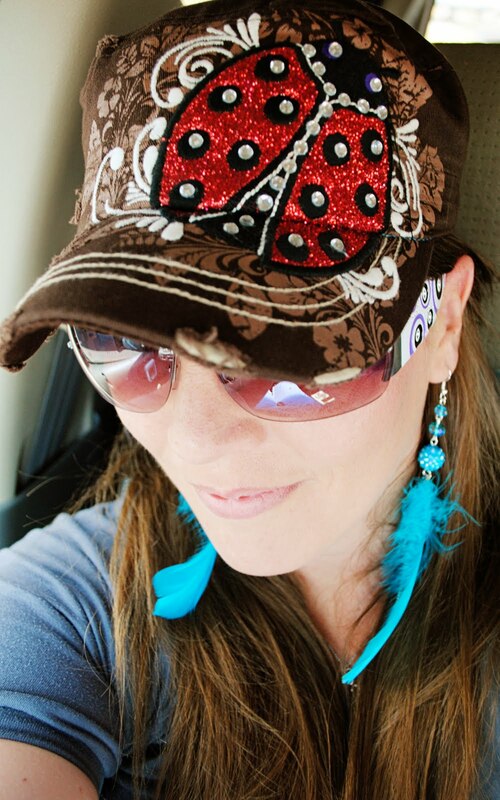 A lady bug hat! You know how I feel about ladybugs!!! If you don't understand the connection with me and my little lady bugs you can go HERE! Let me know if you start participating in EMBRACE THE CAMERA!!! I'd love to see your GORGEOUS PICS!! Friendship Bracelet Swap 2011–COUNT ME IN!! Have you heard the FUN NEWS? Ruffled Sunshine and The Modern Marigold are hosting a Friendship Bracelet Swap! Oh goodness…bust out the Electric Youth and your Swatch Phone!! It’s going to be FLASH-BACK FUN!!! I signed up last week!! Hurry up and sign up too! Today is the LAST day to SIGN UP!!! Maybe we will be BRACELET friends!! I can’t wait to go pick out my thread and get going!! To participate you will make 3 bracelets…and be matched up with 3 new friends to mail them to! I love new crafty friends!!! And then of course…you end up with 3 bracelets from even more new friends!! There’s a TON of tutorials if you can’t remember how to make them! I vaguely remember how!!! It will beeeeee SO FUN! I will post pictures when I finish mine!! Let me know if you are participating too!! And….remember this style too??? I’m thinking I’m going to do a hair wrap!! Remember those!!! I just know those are coming back in style too!!! YAHOOOO!!! Happy new and bright and SHINY week to you!! How’s your Monday so far? Mine? Oh it’s pretty swell! Not too many complaints. Except…my little man isn’t here. There are no dinosaur-hauling tricycles rolling through the house today. This cute face isn’t here. And hasn’t been here since Friday. And won’t be until Sunday. GULP! It’s his first time to EVER be gone from home that long. I’m trying to stay calm. But it’s not easy!! I’ve decided to be positive about the entire situation. He’s getting some extra time with his Dad…and I’m getting some much needed single Mamma rest. I’m using this time to rejuvenate and get ready for another year of rockin’ it out as a single Mamma. I always joke that people think visitation is just for the Dads and kiddos…but really it’s for the Mammas who are raising their kiddos to rest, rejuvenate and replenish their soul strength to keep doing a great job! So far I’ve been doing pretty good! Friday my Dad and I loaded a TRALIER full of clutter junk to haul off from my house. Oh that felt Grrrreat! Bye bye clutter!! Saturday I met my cousin for some fun at Summer Mummers in Midland. Something the OLD Tiffany wouldn’t have been brave enough to do. I marched right up there…and had a LARGE time!! Summer Mummers is actually the longest running summer theatre in Texas! Pretty neato!! You can read more about it by clicking HERE! I wasn’t sure if I was supposed to be taking pictures so I snuck a few. They are all mostly blurry and crazy! But they are cute!! I could barely hear the actors. But what I did hear was hilarious! It reminded me of my One Act Play days back in the day!! I think the main thing about the whole event….is throwing popcorn…at every one!!! And throwing more popcorn!!! Wouldn’t you hate to be on that clean up crew?? It’s hysterical!! You can’t help but have a GREAT time!!! I laughed the ENTIRE TIME!!! And threw popcorn at random strangers! Popcorn stress relief! LOL!! This is the only shot of my cousin and I that I got…and of course it’s WONKY! LOL!!! You can tell we had a BLAST though!!! I reeked of popcorn when I got home …like oily-popcorny-smell…even in my hair!!! It was so worth it though!! I plan on going every summer now!!! Love it!!! I’m saving my mug for round two in Summer 2012! I tried something new on Sunday…my Dad my homemade crepes with fresh fruit! Never had them! They are AH-mazing!!! Then…I went swimming after dark…under the stars! That was FUN!! And relaxing! I think stars may have star beams that give you extra soul power! LOL! It was very refreshing!!! My Mamma hooked me up with two great reads for the week! And the Somerset Digital Studio magazine. Oh deeeeelish!! I’m already in the 5th chapter of Black Heels to Tractor Wheels and have already decided to use a few elements from the Somerset magazine to redecorate my blog!!! I love digital art inspiration!!! Whew…crazy busy huh??? And there’s more!!! I applied to graduate school for the Fall at my old Alma Mater!! I’m so excited and dying from anticipation to see if I am in…and can start!! I will be travelling once a month to Alpine…a 3-plus hour drive to the gorgeous mountains for class. It’s my heaven. My soul still resides there. I decided to just GET ‘ER DONE and go for it!! It’s little scary…graduate homework is no joke! But I think I’m ready to tackle it! I juggle everything else…I can do this!! I GOT THIS! Soooooo….depending on if I get in…which I hope so!!!! Our lives will be changing a little. In a good way! And in a year you can call me MASTER Tiffany! LOL!! Photo shoots are too stinkin’ fun!! I often forget to include all of my photo fun on Easie Peasie…so I’m going to try to regularly show you a few behind the scenes action…or just some new things we might be trying out! This weekend we had such a blast at a bridal shoot we did in a neighboring town. We laughed from beginning to the end!! We had stalker armadillos that scared our pants off…and we had to chase one away! We even did a little planking! Our bride was such a great sport!! She did every crazy pose and place we wanted!! See what I mean!! LOL!!! Sonya planking like a champ off of the SPRINGS wall!! Lorie getting a few shots! And me on the OTHER SIDE of the SPRINGS! Here’s how a few turned out! We also did a fun photo shoot in the West Texas Full Moon with our little gang of friends on Friday night! WAY FUN!!! We did these with a point & shoot camera…it would have been neat to see what a BIG BESSY camera would have done!! LOOK I’m touching the MOON! Pretty neato burrito huh??? It was SO FUN!!! Hope everyone is having a FABULOUS week SO FAR!!! !